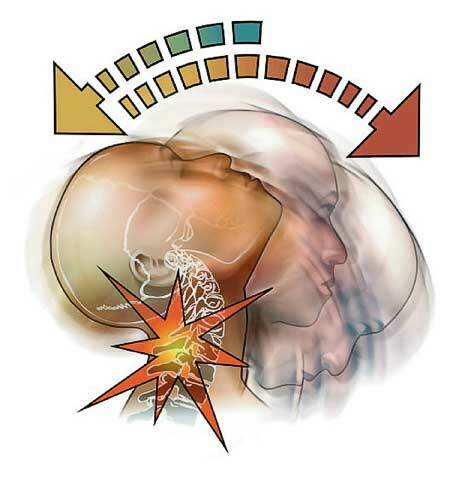 Whiplash damages the tissues of the spine. This includes spinal joint cartilage, the disc, the tendon's and ligaments and the muscles and nerves. These tissues can be injured in a variety of ways. Healing with injured tissues or alignment issues can result in a lifetime of symptoms! The alignment and gliding of spinal vertebrae and their joints are affected by trauma. This can permanently affect the endurance of the neck and the way your neck moves. Proper therapy is essential to restore your spines biomechanical movement and function or you may heal with a lifetime of permanent symptoms. The forward and backward whip-like bend of the neck can damage the fibers of the cartilage disc as well as the tendons, ligaments, muscles and nerves. ANTALGIC-TRAK therapy treats these injuries.